* Consumption of raw or undercooked meat, seafood or eggs may increase the risk of foodborne illness. Tempura Shrimp (5 pieces), Crab Salad, Cucumbers, Edamame Beans, and choice of dipping sauce. Great for Kids! Spam (3 slices), Crab Salad, Cucumbers, Edamame Beans, Corn, Furikake, Fried Onions, Green Onions, Unagi sauce. Unagi (Freshwater Eel), Crab Salad, Cucumbers, Edamame Beans, Furikake, Green Onions, and Sesame Seeds. Hamachi (Yellowtail) Collar lightly seasoned with salt and pepper. Then baked until golden brown and crispy. Served over rice with furikake, cucumbers, lemon wedge, and ponzu dipping sauce. Salmon, Ahi Tuna, Spicy Tuna, Crab Salad, Avocado, Cucumbers, Green Onions, Fried Onions, Furikake, Spring Salad, Garlic Shoyu + Citrus Ponzu sauces. Tempura Shrimp, Crab Salad, Avocado, Cucumbers, Furikake, Spring Salad, Spicy Mayo + Unagi Sauce. Salmon, Tempura Shrimp, Crab Salad, Avocado, Cucumbers, Spring Salad, Green Onions, Garlic Shoyu + Citrus Ponzu + Spicy Mayo sauces. Spicy Tuna, Ahi Tuna, Crab Salad, Jalapenos, Habanero Masago, Corn, Cucumbers, Fried Onions, Furikake, Spring Salad, Spicy Mayo + Sriracha Chili sauces. Salmon, Ahi Tuna (2 scoops), Avocado, Wakame, Edamame Beans, Dried Seaweed, Yellow & Green Onions, Citrus Ponzu + Sesame Shoyu sauces. 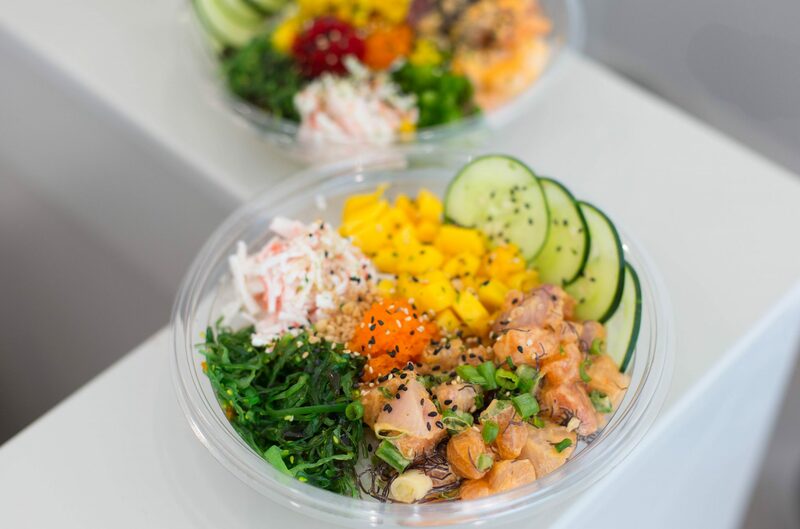 Spicy Tuna, Habanero Masago, Crab Salad, Jalapenos, Cucumbers, Dried Seaweed, Yellow & Green Onions, Spicy Mayo sauce. Ahi Tuna, Masago, Seasonal Fruit, Cucumbers, Edamame Beans, Dried Seaweed, Yellow & Green Onions, Sesame Shoyu sauce. Tofu, Avocado, Wakame, Cucumbers, Edamame Beans, Seasonal Fruit, Green Onions, choice of sauce(s). Oreo, Strawberry Cheesecake, Mocha Almond Fudge, Green Tea, Taro. Please call for seasonal flavors. Flavors: Light Salt or Wasabi. Flavors: Original, Maui Onion, or Luau BBQ.